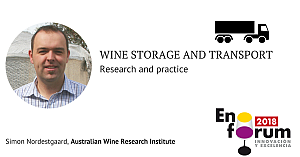 Simon Nordestgaard's conference at Enoforum 2018 will summarise the latest research on wine storage and transport from around the world and provide practical guidance for producers. Topics to be discussed will include the influence of temperature, oxygen and closures on wine composition, temperature dynamics that can occur during bulk and bottled wine transport and logistics options. Simon is a Senior Engineer at the Australian Wine Research Institute where he has worked for the last 8 years. He has bachelor degrees in chemical engineering and economics and a PhD relating to grape pressing. He has performed research, extension and consulting on a diverse range of topics, including winery refrigeration, lees management, the history and evolution of winery equipment, tracking adoption of new technology and practices, and wine storage and transportation.